Are there dead spots on your home or work Wi-Fi network? Do you know all the devices that are connected to it? Are the unauthorised devices? These Android phone apps provide the answers. Wireless networking is easy in theory, but is sometimes harder in practice. The Wi-Fi signal may not reach all parts of the home or office and there could be dead spots where devices do not work at all. Most likely though, they will just work poorly and you will not know why. Measuring the wireless signal strength around the building can help to identify areas where the signal is poor and would benefit from a boost. It may simply involve moving a wireless router a few feet to a better position. You may think you know all the devices on your wireless network, but there may be devices that you are not aware of. This happens more in the office than at home where employees may bring extra devices to work, but even at home you may find your neighbour is logging onto your Wi-Fi and using it for who knows what. A Wi-Fi scanner will look for devices connected to the network and list them so you can check that only ones you have added yourself are present. Sometimes you need to know the IP addresses of Wi-Fi devices, like a wireless printer, and a Wi-Fi scanner can tell you in an instant. Who’s On My Wifi is a simple app that scans the network and lists the devices it finds. The manufacturer or model name of the device is listed, but it does not tell you what it is. For example, I cannot tell iPhones from iPads from MacBooks because they are all listed as Apple, Inc devices. I have an HP printer and an HP laptop, but only one HP device is listed. The other one may be the Intel Corporate listed, at least I can’t think of anything else it could be. The IP address, gateway, MAC address and DNS is displayed for each device. I found it too basic for my needs and it didn’t show enough information to identify all the devices on the network. Some I was left to guess what they might be. 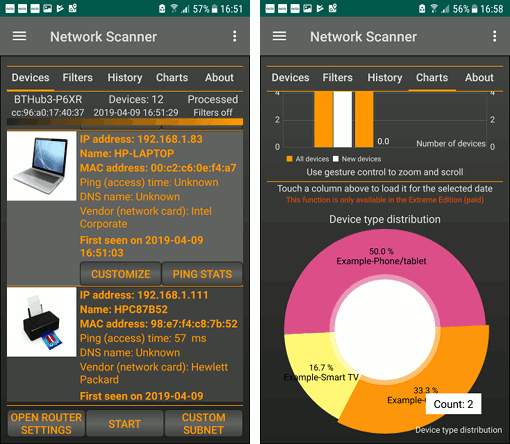 Network Analyzer performs several functions and the home screen shows every detail about your current Wi-Fi and mobile connections and it runs to more than two screens deep. Swipe up to see internal and external IP addresses the default gateway, amount of data received and sent, signal strength, and dozens more network details. It is very comprehensive. The Wi-Fi Signal section shows all the wireless networks in the area. The network names are shown, the router manufacturer is displayed, the signal strength and Wi-Fi channels are shown, and more. The LAN Scan feature is excellent and the names of devices were listed, like Rolands-MacBook-Pro, HP-Laptop, Apple-TV, Roland’s-iPhone and so on. It is very easy to see what devices are connected to the Wi-Fi and their IP addresses. There are some geek tools, like Ping, Route, Ports, Whois and DNS. This is a good utility for analysing your network, checking what is connected, finding IP addresses and so on. It is recommended. NetX Network Tools launches straight into a scan of the LAN when the app is started and devices begin to appear on the list. It does a reasonably good job of identifying devices and it found names like Rolands-iPhone, HP-Laptop, Apple-TV and so on. It shows the IP address, MAC address and manufacturer name. Devices can be pinged, although most of my devices do not respond, most likely because of security settings. There is a nice Connection info screen that shows icons for devices and you can see the router details, local and external IP addresses. The DNS is shown and you can see the router IP address. The Wi-Fi network strength is displayed as a live scrolling chart, so you could walk around with the phone to find dead spots where the Wi-Fi is poor. There are also live charts of uploads and downloads, so you can see the phone’s activity on the network. 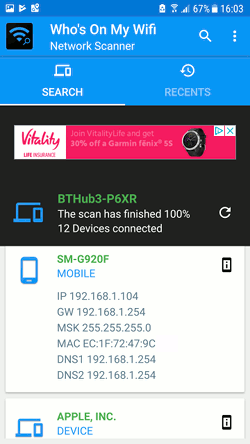 Network Scanner is a great app for discovering devices on the Wi-Fi network and it begins scanning as soon as the app is started. It shows the IP address, MAC address, ping time (how fast the device responds), and where possible, the name of the device. It goes even further and displays a thumbnail image of the device. Not the actual device of course, but if it finds a laptop on the network it shows a generic image of a laptop, and if a phone is found, there is a phone image. This is clever and also very useful when trying to identify devices. It isn’t perfect, but it is still useful. There are filters that enable you to see only devices of a certain type, such as printers, smartwatches, computers, and so on. There are also some interesting charts that show device type by distribution, vendor distribution, access time and more. This is more useful in a company with many devices on the network and at home you probably only have one printer, one computer, and so on. This is a great app for analysing your wireless network. From the screenshots it is obvious that Wifi Analyzer is slightly different to the other apps. It is not a competitor and you will want to add this in addition to one of the other apps. The app turns your phone into a meter, complete with analog style VU meter with pointers that swing with the network strength. The idea is that you walk around your office or home with the app on your phone and you can see the changing signal strength in the meter display. This is great for finding dead spots in the Wi-Fi network. Another screen lists all the Wi-Fi networks within range and shows their signal strength and channel number. It also shows this graphically on a chart too. This is useful when you need to find the least used Wi-Fi channels to avoid clashes with other nearby networks. The add does not show devices on the network except for routers and those show the IP address, frequency, channel and so on. 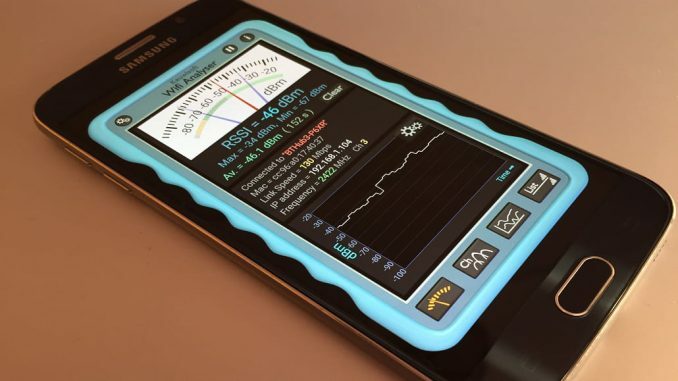 Wifi Analyser looks great and makes an excellent scanner for measuring signal strength. 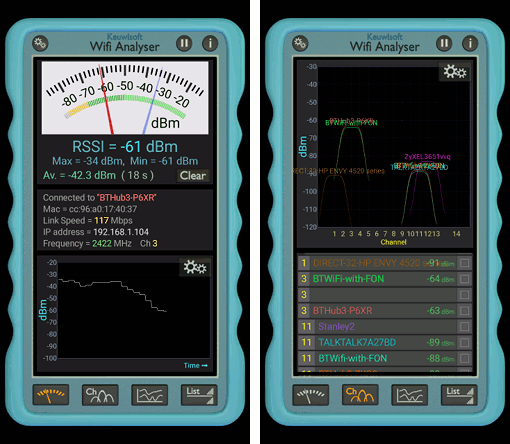 Wifi Analyzer is the best app for measuring Wi-Fi signal strength and is a useful tool to keep on your phone. Network Scanner is good, but I prefer Network Analyzer for its comprehensive network information.